The Superbrain Quest is an accelerated learning curriculum designed to activate your brainÂ’s limitless potential. 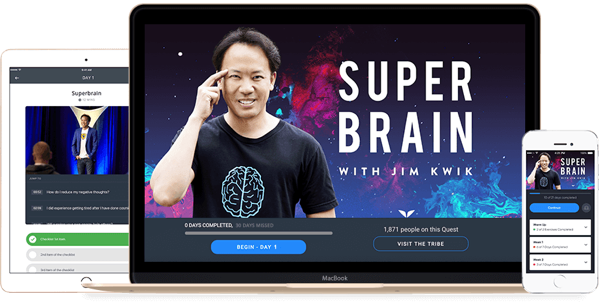 Join Master Mind Trainer Jim Kwik on a 30-day adventure towards a bulletproof memory, unshakeable focus, and superhuman productivity. Whether youÂ’re a professional, entrepreneur, student, or just someone looking to unlock the full power of your mind Â– youÂ’ll experience life-changing elevations in your career and personal growth as you shatter every inner limitation that has ever dared hold you back. But hereÂ’s the challenge: for most of us, school taught us what to learn and not how to learn. The result? Our brainÂ’s raw processing power has been severely limited. WeÂ’re not thinking, remembering, and focusing anywhere near our real potential. And those of us who do have a tremendous advantage in this emerging new world. Learning how to learn is known as meta learning. Jim Kwik is the worldÂ’s foremost expert in training you in meta learning. And in just 30 days, the exercises and mind shifts in this Quest will completely transform the way you absorb, process, and use information. Names, facts, birthdays, anniversaries, shopping lists, passwords Â– how much easier will your life be when youÂ’re recalling all this information at the snap of a finger? Eliminate brain fog from your Superbrain, so you can think smarter, decide faster, and focus better Â– no matter how young or old you are. The Mindvalley Quests learning platform combines the power of community, daily micro-learning, and the worldÂ’s best teachers to give you a dramatically more immersive and transformational personal growth experience than ever before. Can´t believe I signed up for this spam website. Last edited by JohnSmith1997; 02-09-2019 at 10:25 AM. Hello, I downloade all the files and tried to unzip all 12.6 GB of it, but it says I need a key due to encryption. What key should I use? Upon entering (random password), I get a message saying that part of the data is missing or that the file is corrupt. WinZip was able to extract only part of the file /Users/*****/MEGAsync Downloads/Jim Kwik Superbrain/Jim II/untitled folderAB/Jim Kwik - Superbrain/0.Masterclass/By ***Marked As Spam******Marked As Spam******Marked As Spam******Marked As Spam******Marked As Spam******Marked As Spam******Marked As Spam******Marked As Spam******Marked As Spam******Marked As Spam******Marked As Spam******Marked As Spam******Marked As Spam***.url because it contains invalid or missing data. Would you like to keep the partial file? (Note the partial file will be named /Users/*****/MEGAsync Downloads/Jim Kwik - Superbrain/0.Masterclass/CORRUPT.By ***Marked As Spam******Marked As Spam******Marked As Spam******Marked As Spam******Marked As Spam******Marked As Spam******Marked As Spam******Marked As Spam******Marked As Spam******Marked As Spam******Marked As Spam******Marked As Spam******Marked As Spam***.url).